Hello! Today Sparkle Creations Rubber Stamps is celebrating the Operation Write Home Birthday Bash by hosting a challenge. If you are unfamiliar with them, OWH's mission is to support our nation's armed forces by sending blank handmade greeting cards for them to send home to their loved ones, as well as cards of gratitude to encourage them. 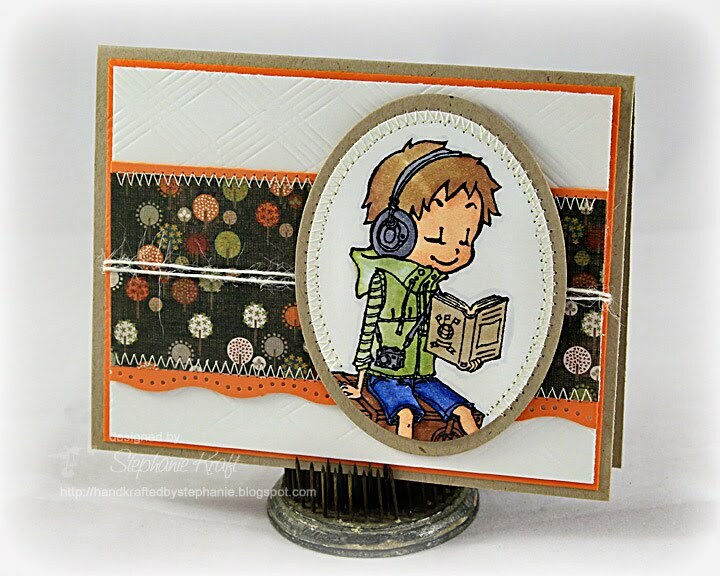 The SCRS challenge is to make any fall-themed card. You have until next Thursday, 9/30, to enter the challenge. Everyone who participates will get 10% off any purchases made within the next week. Be sure to head on over to the Sparkle Creations blog for more details, to link your card and get your discount code! This is the card that I made for OWH. I used Traveling Josh for my image and kept it relatively simple so that it would fit in a standard-sized envelope. I've been wanting to make some cards for quite some time, so this was just the push that I needed. There are some basic guidelines for any cards sent to OWH -- you can check it all out HERE. Accessories: Oval Nestabilities (Spellbinders), Dotted Wave border punch (EK Success), Picnic Plaid Impression Plate (Papertrey Ink), Markers (Copic), Twine (May Arts), Foam tape, Thread, Sewing machine. This is darling! Sandy will be so excited...she's been wanting to use that image for cards for awhile! Cute card Stephanie! Great job coloring that sweet lil' boy & your stitching looks awesome! A wonderful card, Stephanie! Love the simplicity of this one! Great idea to pair up with OWH! Great image and fabulous coloring and design.